1. Soak the basmati rice in water for 20 minutes. 2. Heat oil in a pan and add the rice. 3. Fry for a while and keep aside. 4. Soak the soya granules in water. 5. Drain and add the soya to rice. 6. In a pressure pan, add 2 tsp of oil. 7. Add the bay leaves, elaichi, cardamom, cloves, chopped onion, grated garlic and red chilli. 8. Fry for 2 to 3 minutes. 9. Add the chopped tomatoes, turmeric powder and dhaniya powder. 10. Stir well and add the soya-rice mixture and peas. 11. Fry for 30 to 45 seconds and add garam masala powder. 12. Add water till the rice-soya is immersed and salt. 13. Pressure cook for 2 whistles. 14. Wait for the pressure to reduce before opening. 15. Remove and serve hot. Tip: Adjust the water for the rice as required. 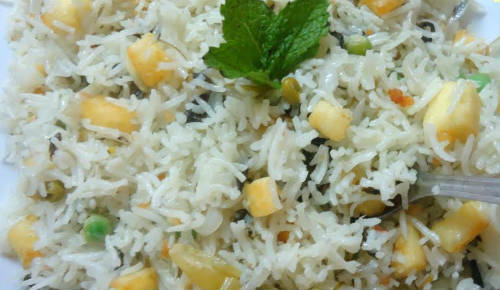 Feel free to comment or share your thoughts on this Soya Mutter Pulao Recipe from Awesome Cuisine.